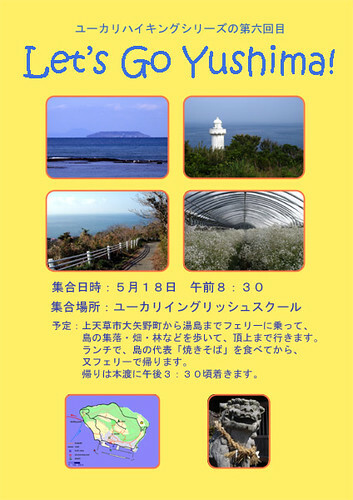 A poster I threw together to attract interested parties to our school's annual hike. Every year we go to a different, (hopefully) interesting place of our choice in Amakusa. Note the intentional English error, following the 'rules' of a common Japanization of our language - if you can't beat them, join'em! To their credit, the more alert students actually noticed. Last Sunday we went to Yushima with some students from our beloved Eucalyptus English School (EES). 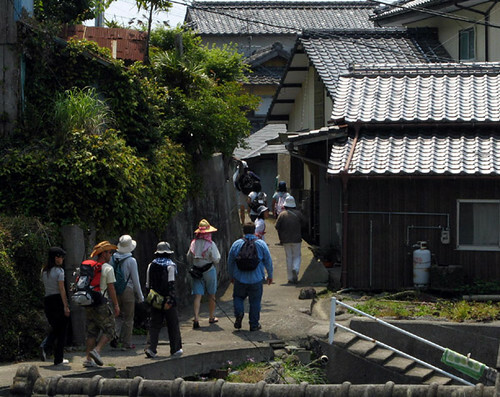 Yushima is a relatively isolated island in Amakusa, offering a unique atmosphere and walking opportunities (see our previous entry). 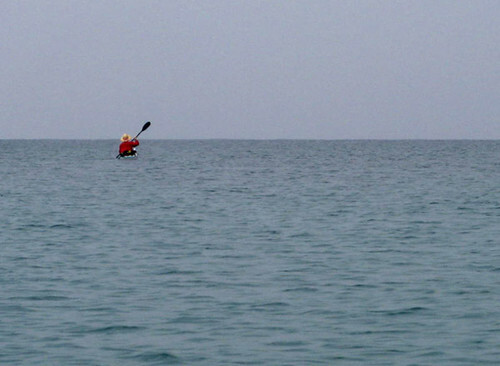 While everyone took the passenger ferry to the island (there is no car ferry as there is no use for a car there), the two of us paddled in by kayak, of course. 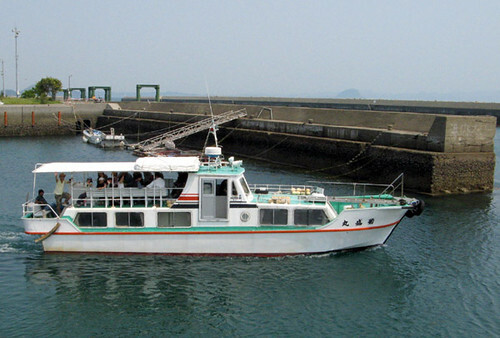 Usually we come from Oniike, 17km to the west, but this time, we were obliged to go from the Misumi strait, 11km to the east of Yushima, to accommodate the currents that matched the timing of the trip. It was a fun, relaxing day for everyone, and so it seems the yearly EES hiking trip was a success. Here are some maps and pictures. A simulated aerial view of the trip; imagery is based on LANDSAT data. The red track is our kayak trace; embedded within are yellow and light blue lines representing ebb and flood (respectively) measured current directions and speeds. The swiftest current was about 2.3kt (on the return leg) but at mid-spring tide, expect currents in excess of 3kt, with associated danger of overfalls in windy weather. It's obviously possible to make this 25km round trip very comfortably riding on the currents if your timing is right, and each way oughtn't take more than 1 1/2 hours. 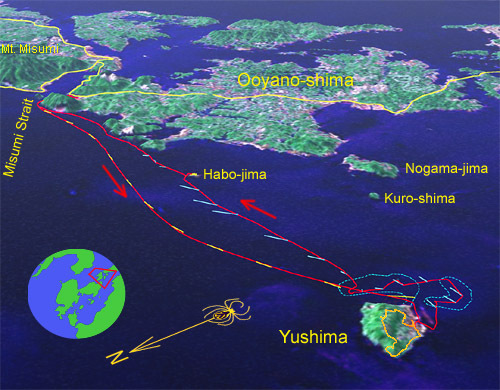 Also marked are paths hiked on Yushima and Habo-jima (see also below; the other yellow lines are national highways bridging Amakusa to Kyushu), and shoals to the south of Yushima are outlined in blue. 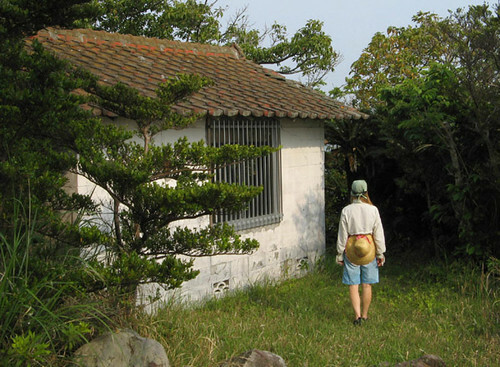 Okinose, a moveable gravel bank, is located on our path directly 'above' Yushima. 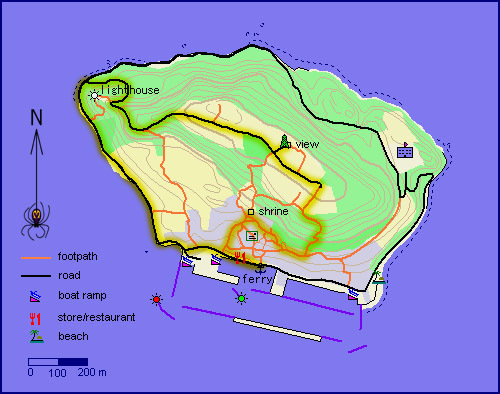 A more detailed map of Yushima also showing last Sunday's walking route, which takes in most of the island's interesting sights. The back road around the island is also highly recommended. The troopers tromp through the tiny town's terraced trails. In the greenhouse full of Baby's Breath. Lunch is the happiest moment of any hike. 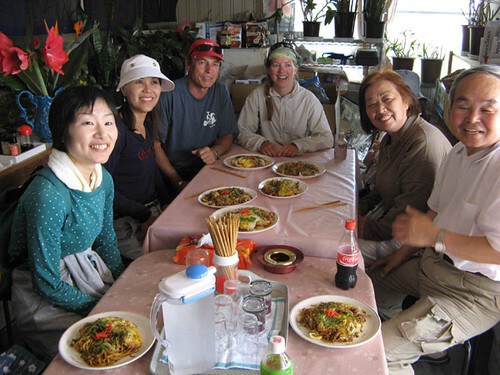 The island's yakisoba or fried noodles are not for pushovers. There is an egg in there too! When everyone departed on the 2pm ferry, it was time for us too to return. However, instead of going directly back, we took in a few interesting sights along the way. This being our first time here at low tide, we took opportunity to explore the extensive sandy shallows that lie to the south of the island. 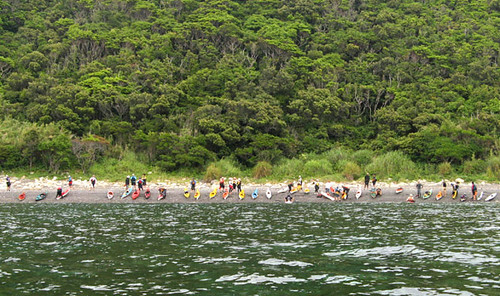 Around here we saw schools of thousands of sardine-like fish called hadara swimming about; it is their spawning season. 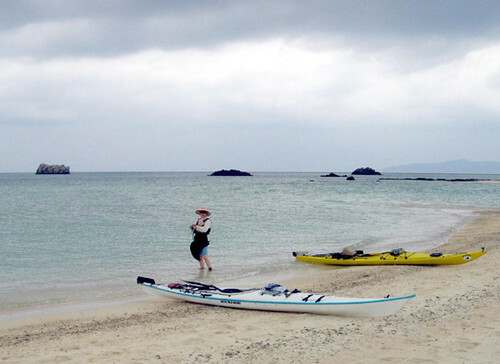 There is also a gravelly isolated gravelly spit called Okinosu which just barely emerges from the sea at spring tides; its location was actually more than 100m from its charted position; maybe it gets moved around by storms like the several much larger sand and coral banks around Iriomote Island in Okinawa. At another place, seaweed grew thickly. So even a shoal like this is filled with mystery: why does a spit form just there, while seaweed grows here but not over there? And off they go back by ferry. There is no car ferry service to Yushima as there is hardly a road here one could drive on! 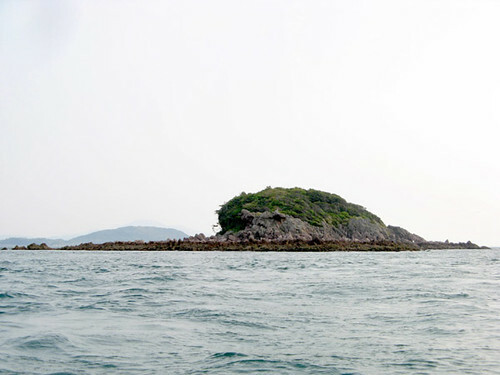 The tiny uninhabited islet of Habo-jima lies on the way to Misumi. As we poked around, the tide began to pour in and the flood current picked up. This we rode eastward toward the tiny uninhabited island of Habo-jima. 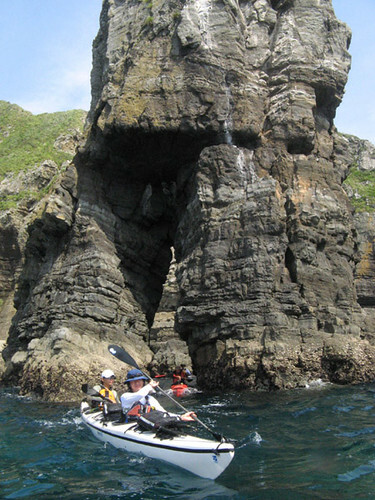 We’d been there only once before (during our Kami-shima circumnavigation), when we found the island’s prominent feature: a gravity-defying natural stone arch. Since then a perusal of aerial pictures revealed a well-hidden roof inside the trees. Maybe someone’s private cottage? We landed and explored; the structure turned out to be a small shrine. 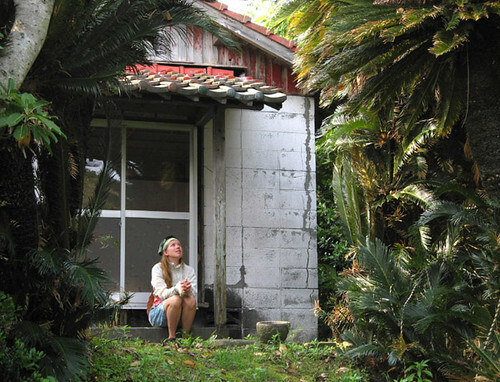 What a beautiful little place Habo-jima is, though; a small world unto itself. 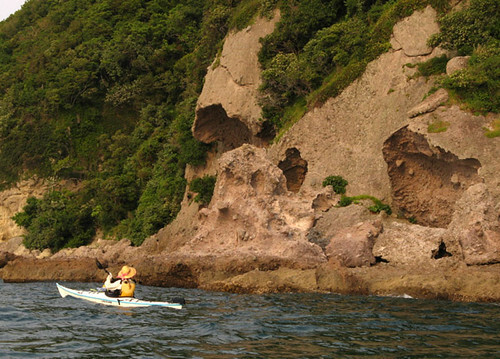 Bizarre, bare volcanic rocks along the shoreline culminate in wildly overhanging bluffs, atop which sits a small patch of thick, untouched forest. 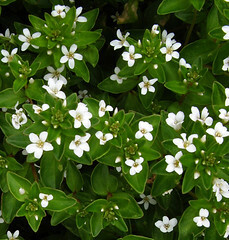 Within this green sanctuary the shrine offers a moment of quiet solitude. 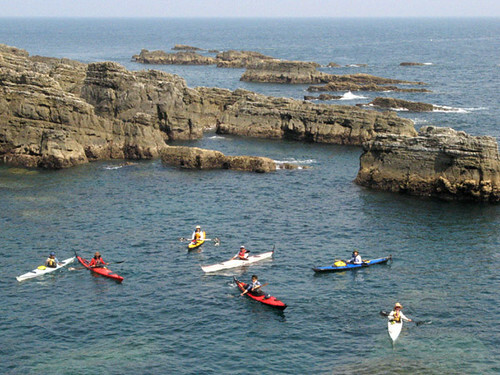 The bizarrely shaped volcanic rocks of Habo-jima are of a rich brown color. Found it! It's a small shrine. Enjoying a peaceful momet in a beautiful place. Leaving Habo-jima, we followed the attractive volcanic shoreline of Kami-shima back into the narrow, fast-flowing Misumi Strait. Arriving back at Iwaya about an hour before dark, we packed up very leisurely and chatted with the lively and friendly fishermen and local inhabitants. 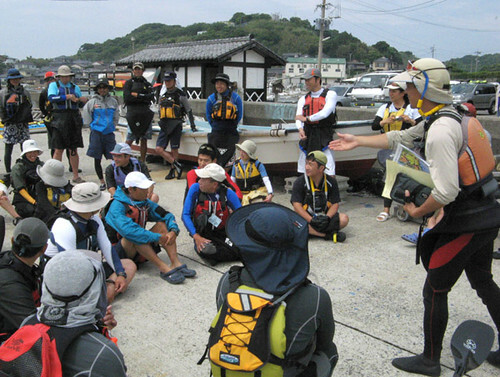 One of them, a Mr. Torihama, had seen us near Yushima from his fishing boat and was very surprised at the speed and efficiency of our kayaks. 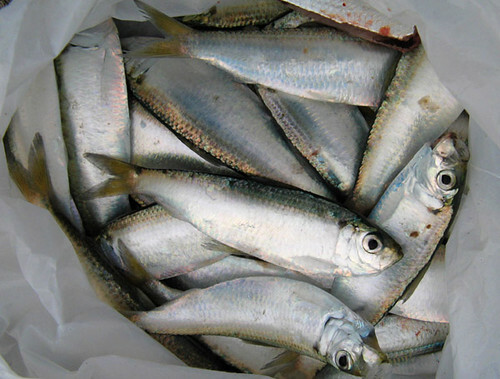 He had caught a cooler-full of a variety of fish, including many hadara, and he proceeded to give us a bagful, proceeding to explain in great detail how they are best prepared and eaten. We had a very nice time talking with him and a delicious fish dinner to boot after returning to our humble abode in Hondo. 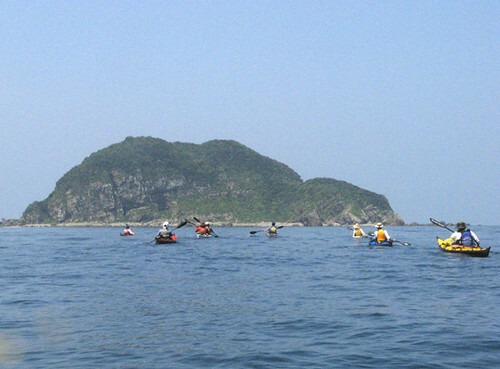 Following the coast of Ooyano Island with its interesting volcanic rocks. The sardine-like fish we received from Mr. Torihama (to appear later is the really cool palm-frond hat he gave us - he makes them for kicks). Hello everyone. 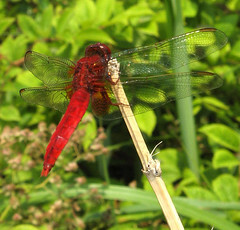 We're back from our ten day vacation from Okinawa, and what a great time it was. Adventure, beauty, pristine nature, eye-opening learning experiences, fun, new friends... one could not ask for anything more. But before we get started on this one, we'd like to point out to you that from now, we will be including Japanese text as well for the benefit of the folks in whose country we are living. If your computer does not have Asian fonts loaded, the Japanese will likely appear as garbage on your screen. If that is the case we apologize to you (on behalf of Bill Gates, really) for the corresponding degradation in the aesthetic quality of our blog. If you really want to, you can load the fonts for free...instructions are available with Windows. Then again, if you can actually read the truly hieroglyphic Japanese script, you probably have the fonts already. 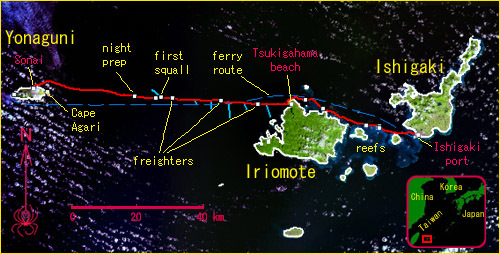 A summary map of the Yaeyama Islands and our Ishigaki to Yonaguni 2-day traverse (background image courtesy of LANDSAT - the ever-present cloud buildup probably cannot be helped). 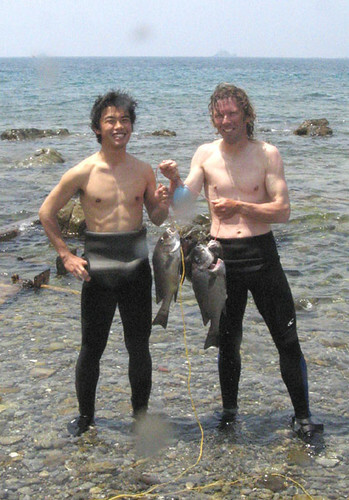 After an initial 47km day darting in and out of coral reefs, we landed on Iriomote Island's Tsukigahama. 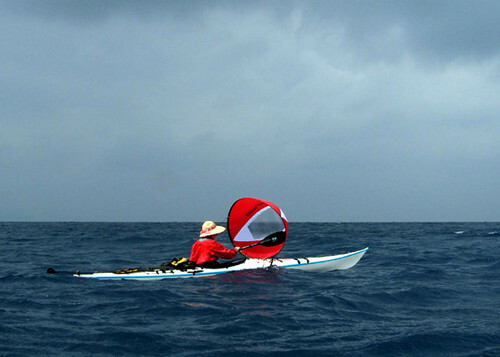 The next day we tackled an 82km open sea traverse to Yonaguni. Markings on the map are mostly self-explanatory and many refer to events described below. The turquoise lines during the first half of the open-sea traverse are measured currents (the fastest was about 2 knots); during the latter half we did not have the luxury to take further measurements, but currents seemed to have been more or less north-setting, 1 to 2 knots. On the first day, we made a few brief but interesting stops, including this one at Suna-jima, a small spontaneous sand spit among the extensive reefs between Ishigaki and Iriomote. 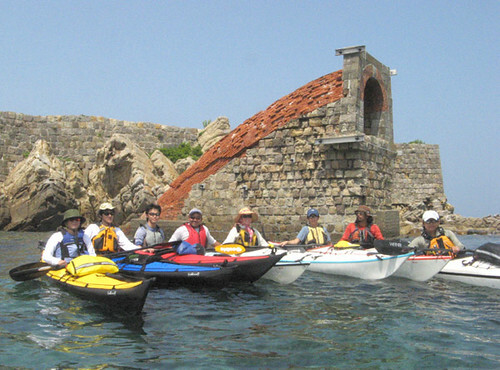 The group rocks in the background marks the outer edge of the reef and, isolated as it is, forms an important natural beacon for all shipping approaching Ishigaki Port. It’s 11am on only our second full day in Yaeyama, and we are already departing Iriomote Island’s beautiful Tsukigahama beach for a straight shot to Yonaguni, one of the most isolated of all Japanese inhabited islands, due west of us and 80km away. Up to this point it has been smooth going: flights to Ishigaki on Sunday, trying to look innocent inquiring about the ferry back (yes, we’ll take the plane there, we said), then Monday morning, picking up our boats from the shipping company’s warehouse, whose staff once again kindly dropped them off at the nearest boat ramp; then the seven hour, 47km traverse to Iriomote’s Unari Cape, darting in and out of reefs already well known to us. There was plenty of tail wind, giving us an opportunity to try our new Wind Paddle sails, which worked beautifully: at the end of the day we really could not feel in our muscles the distance we had covered. 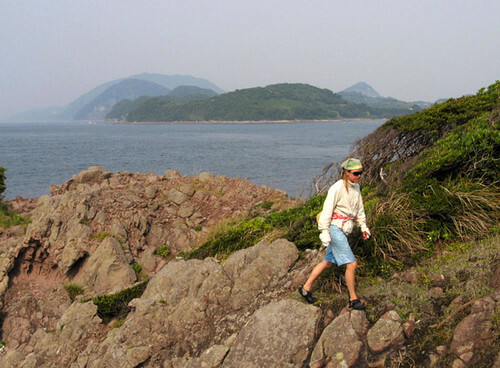 The beautiful Tsukigahama, seen here in a soggy condition, was our departure point for the big traverse. 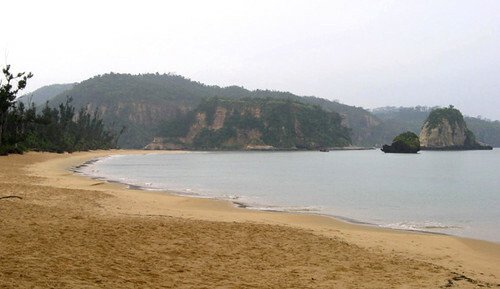 Although not the closest land to Yonaguni, the beach is strategic if approach is made from the north side of Iriomote, as was the case with us. At night we met up with Chika and Saeko, our good friends and local kayak guides by trade, who once again offered us a tasty dinner, a place to crash out of the rain, and the all-important Internet weather check in the morning. And lo and behold, a moderate east wind is to hold for the day, much more favorable than the storm that had been forecasted the day before. Just like that we scrapped our tentative plans to poke around Iriomote’s wild northwest coast and decided to set out for Yonaguni straight away. Not having expected to go, we did get a late start. But a night paddle would have been inevitable anyhow, so new moon or not, we’ll deal with it, we said to ourselves. 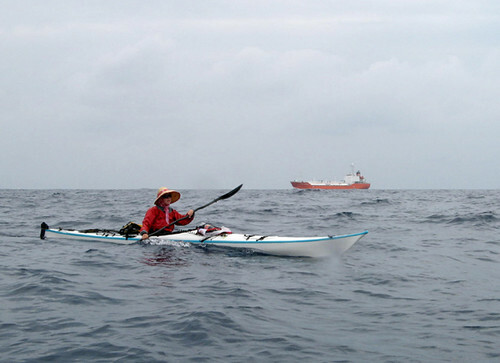 Leanne departs Tsukigahama towards Yonaguni, 80km beyond the horizon. The sea looks deceptively calm on this, leeward side of Iriomote Island. It's smooth sailing, for a while. Leanne tucks the sail's lanyard behind her head (the ears forming useful hooks) so that she can paddle as well. This way, we move along at 4 to 5 knots with very little effort. Shipping hazard. Busy smoothing the kinks out of our sailing, we neglected to look around for incoming shipping and let this Chinese freighter approach us from behind a little closer than we normally would have allowed. Sails were quickly stowed on the ship's approach lest their color attract the attention of the crew. The Wind Paddles are deployed and, paddling along, we are making good headway in spite of a slight countercurrent that begins unexpectedly offshore after we cross a rather active eddy line. Almost right away we meet with shipping traffic; by Murphy’s Law we always seem to be on a collision course with some huge ship in spite of the immense size of the Pacific. 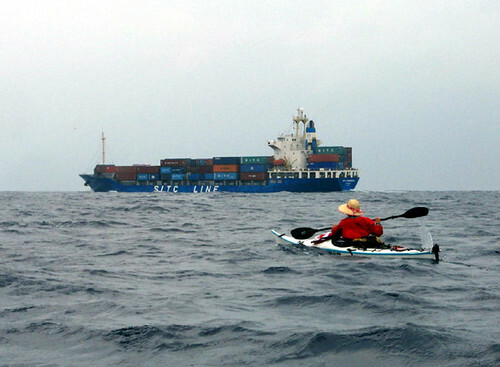 So we pull some maneuvers to keep just outside spotting range of the overloaded Chinese freighter. A while later the wind dies, so we stow the sails and paddle energetically against the persistent current, still making reasonable headway. 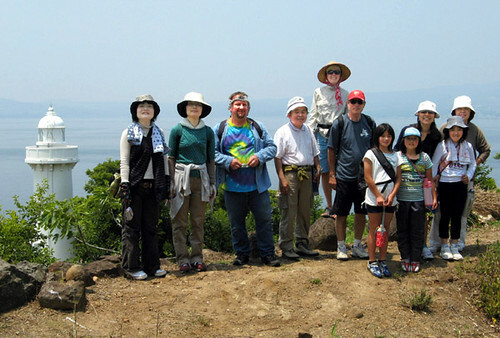 In spite of the calm, the sea is choppy, no doubt because we are at the meeting point of waves diffracting around both sides of Iriomote Island, which is now fading into the haze behind us. A Yonaguni-bound Boeing 737 glides directly overhead, perfectly aligned with our course – we’re both navigating well, it seems! For a jet, of course, the 124km between Ishigaki and Yonaguni airports is just a short hop, so it cruises easily overhead at mid-altitude with engines at half power. This is normally about the distance we let other ships pass us. Which country this one belongs to is not clear, but its name at least was English. At the 25 km mark, we finally lose sight of the land behind us, and continue on surrounded by only the watery horizon, the occasional sight of another freighter, and inquisitive boobies who have had no trouble spotting us while surfing the wind wakes of the big ships. The choppy waves cross-hatching the sea continue to remind us of the land we left behind and I think of primitive navigators who could estimate the size of and distance to as yet unseen lands from the character of the waves, a skill that seems to come naturally while living with the sea. The counter-current presently quits altogether, and we continue on solely under our own power, the chop gradually calming down too. We’re wishing for the forecasted tailwind so we can unfurl our sails to effect. Sailing, the GPS ETA was about 10:30pm, but like this, we won’t make landfall until sometime after midnight. Inquisitive boobies taking a ride on the freighters' wind wakes often came to say hi. 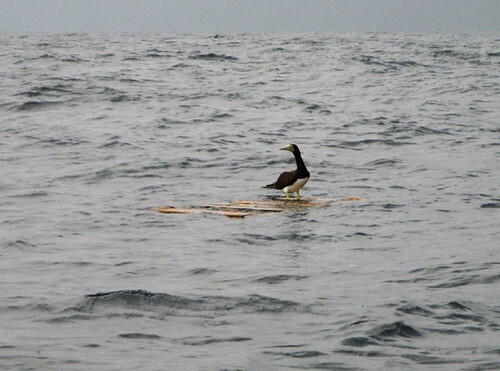 Boobies (as the name implies) are comical birds, ridiculously clumsy in their nevertheless undaunted efforts to catch flying fish. They dive into the sea after them in all the wrong places but we guess they don't float very well, which may be why this one found some flotsam to alight on, 30km from the nearest land. A squall that has been following us persistently finally moves through, with a fresh breeze following. Sails come out but after 15 minutes or so, we’re ripping forward at such speeds that they need to be stowed again. 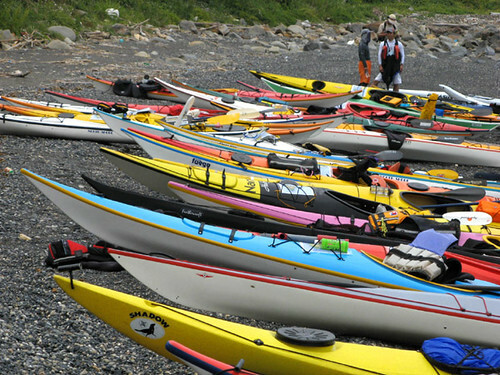 We’re still novices at kayak sailing, and this does not seem to be the place or time to be testing our limits. Indeed, the breeze has reawakened the sea as well and now numerous white-crested waves comb the surface, while schools of 50 or more flying fish emerge specacularly from the wave faces, carving graceful, coordinated flight paths in the wind. Every now and then, a set of massive waves rolls through, requiring our undivided attention. Occasionally we’re swept sideways on a breaker, beach-landing style, until it gives up on trying to tip us, retreating ghostlike into the background of smaller waves from whence it came. All this is fine and good, and we’re being blown at a fast clip directly towards our destination, but we’re about to run out of daylight. We wait as long as possible to configure for darkness, hoping the squall will pass, but no such luck. In fact it seems we’re pretty much keeping up with it. So we raft up while I put on my dry top and life jacket (shed earlier to stave off overheating; Leanne had taken a swim). We also bail the boats and deploy lights, so as to be able to keep track of one another in the oncoming darkness. Daylight fades and squalls gather as we surf down the final few waves at breakneck speed, trying to make as much headway as possible before complete darkness descends, for then there will be no choice but to quit paddling, raft up, and drift along on the wind. 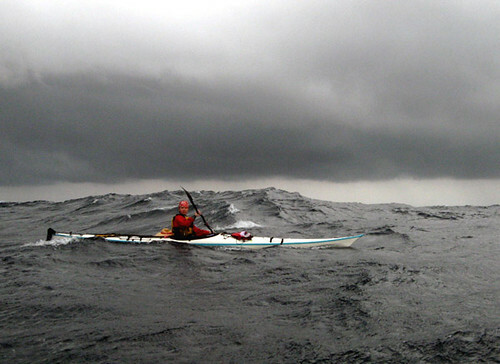 But as darkness slowly embraces us, it becomes evident that paddling will not be possible for much longer. The horizon grows fuzzy and it becomes annoyingly difficult to keep balance and a consistent heading. 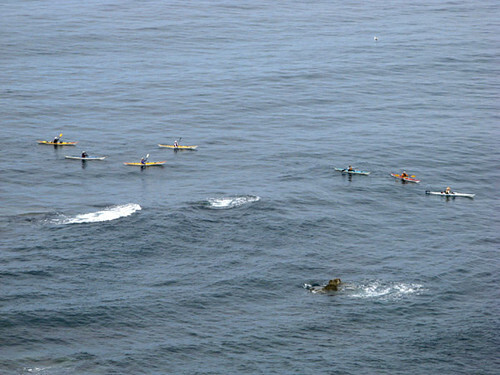 Leanne is surprised by a wave and briefly tips into the drink, reappearing on the surface in the blink of an eye – an expertly executed roll at a record distance – still more than 30km – from land. That does it – there is no choice but to raft up. This we do with an attendant feeling of warm comfort and stability. Soon it is pitch black, to the point where even the horizon cannot be made out whatsoever. All we can see are the phosphorescent white crests that roll around and over us; Leanne unwittingly anticipates the approach of one of the first, observing: “I think I hear a jet.” But there are no flights to Yonaguni at night, and overhead there are only black clouds blotting out the sky; even the sea can only be felt more than it can actually be seen. There is no need to be reminded to look out for the next big wave coming. Natural instincts take over. 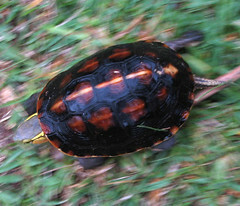 Preparations for nighttime complete, we hasten to shrink the distance between us and land in the fast-fading daylight. Still, all is fine and good, though we get a little nervous anticipating what might happen if conditions were to get any worse. During the day, a sea like this wouldn’t be much trouble, but the challenges of complete darkness are making themselves felt. Controlling the heading of our raft is most important – we absolutely need to stay perpendicular to the biggest waves lest they bowl us over. The GPS heading is of no use as we’re being tossed this way and that, so we train a headlamp at the compass instead and aggressively maintain a heading due west with our rudders. We take turns at the compass, calling to each other, “Hard right! OK, straight!” like the crew at the bridge of some typhoon-molested ship. Big waves roll in regularly about every ten minutes, just like at a surf break; their roar gives ample warning of their coming. We have no problem holding on to each other as the crests wash over us, and we can pump the bilges occasionally in the relative calm between the sets. Every now and then we check the GPS, and our course is fine. 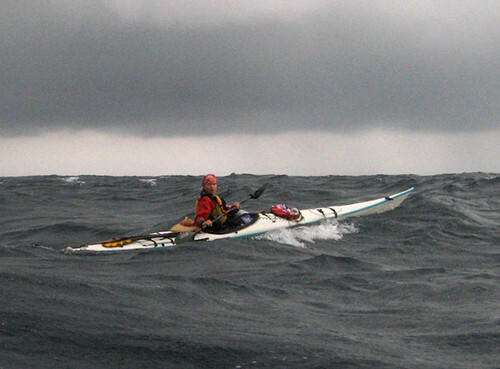 The wind is blowing us straight into the island, at about half paddling speed. ETA now is about 4am. Rain showers pass through and here and there lightning flashes, but in between squalls we finally catch sight of the Agarizaki lighthouse, now 20km dead ahead. With this sole landmark, maintaining heading instantly becomes easy; among our worries has been seasickness from staring at the compass. 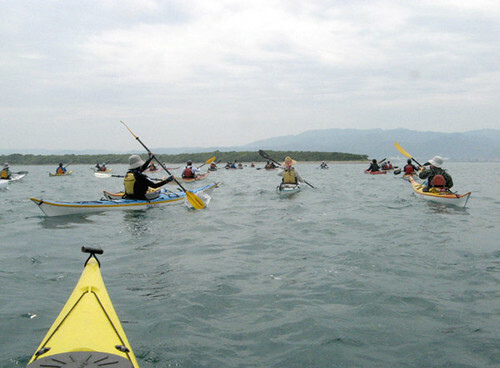 But we’re fine, though challenges remain: how to avoid the tidal races that are bound to occur around the island, and would we be able to hold our balance and paddle once more lights come into view? A brief early try shows that it’s still too difficult. Would it be better to turn into the storm and put on the brakes somehow to delay our arrival until daylight? Or let the wind blow us past the island, and then fight our way back once it gets light? The first option seems too difficult since we have no parachute (mental note: get one); the second seems a bit frightening to contemplate. But soon I notice a slight northerly drift in our course, indicative of a current. Solely on the basis of this, I construct a mental image of the flows around the island and the likely locations of the resulting tidal overfalls where the currents might meet the waves head on, and we plot our course to avoid these. We’ll give the cape a good berth of a couple of kilometers to the north; that should do it. (In retrospect, this was exactly the right decision, and my year of meticulous study of sea currents around Amakusa has finally paid off!) To control our course, Leanne busts out her sail while I hold on to her boat and our raft lurches forward: not only do we move faster, but rudders become much more effective with the increased speed. These Wind Paddle sails are a godsend. Finally at 3am we clear the cape well to port and the waves are unchanged: no tidal rapids here! 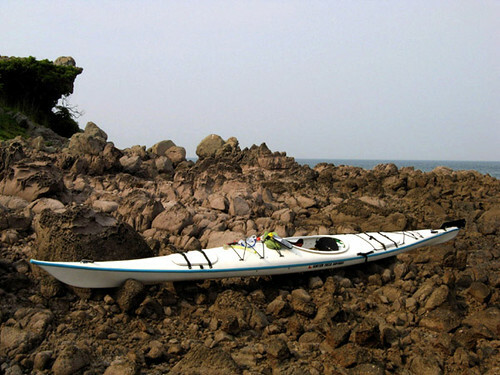 Right at this point it becomes possible to paddle again with the island’s ambient light as a stability guide and we easily correct for our earlier drift, especially after we enter the wake of the cape and exit the current. Now the goal is really in sight – the lights of a small town a few kilometers ahead. But where is the port lighthouse? No navigational lights can be seen, except for the beacon at the nearby airport. But OK, as we close in, a long jetty bristling with piled-up tetrapods emerges out of the darkness in front of us. Rounding its tip and finally entering calm water, we’re shocked to see there is no beacon whatsoever – a rare first in Japan. How is one supposed to get in and out of port at night? Sonai village, Yonaguni's main town, later on the morning of our arrival. As we feel the intense pull of the beach now only 200 meters away, we are met with a final challenge. A barge is actually leaving port, now at 4 in the morning! What the...! They are lighting up the whole place with floodlights and only our incredibly fortuitous timing and a random pile of tetrapods in the middle of the port enables us to sneak past undetected. We play a game of hide and seek around the pile as the barge slides by, its floodlights bright as daylight. If we let them, they could see us from a kilometer away! 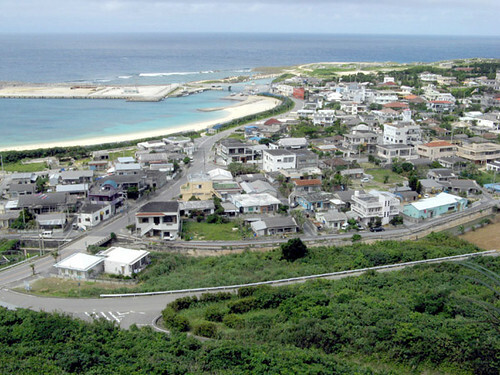 We read and heard there was no camping in Yonaguni, and that this rule was strictly enforced (both proved untrue and unfounded later), but would they go so far as to light up beaches at night to look for itinerant gypsies? Worse still, did our friends Chika and Saeko panic and call the authorities on the arrival of the storm? Crap! In any case, this was no time and place to be detected, under the best of circumstances. We wait, glued to the tetrapods like frightened fish, until the barge safely departs harbor and disappears into the stormy darkness. After that, we are on the beach in no time at all. Terra firma at last!